Kerman Water System Expansion – Yamabe & Horn Engineering, Inc. Working under contract as the City Engineer for the City of Kerman, Yamabe and Horn secured State funding in the amount of $3.1MM to expand the water system serving the City residents. The role was comprehensive and included the design, bid management, contractor oversight and inspection over a multi-phase improvement schedule. Having worked under contract with the City of Kerman since 1993 as their City Engineer, it was known that three of the four water wells that serviced the City had contamination issues with Uranium. As the State regulations were tightened, the wells fell out of compliance and in 2001 a solution was needed. Yamabe and Horn were able to secure State Revolving Funds that provided low interest funding to the City and overhaul the existing water production system, eliminating the Uranium contamination as well as expanding the capacity to handle the growth the City was experiencing. Numerous solutions were researched to salvage the three contaminated wells, ranging from mixing the water with the one good well to dilute the Uranium levels before distributing it to the residents. Another option was to research what layer of the strata the Uranium was leaking into the wells at and attempt to seal off that layer. In the end, the only solution was to dig three new wells in different locations and at different depths to source water that was uncontaminated. In the process, the system was expanded and updated significantly to handle the usages demands of the residents. The most significant feature added was a 750,000 gallon tank that would be used to support peak demand usage as well as provide adequate reserves to meet fire flow requirements. Resident behavior showed that afternoon and evening use in the summer months was highest, so the water tank was utilized during those times, keeping pressure up along the entire distribution system. To save the City operating expense, the well closest to the water tank was setup to fill the tank directly, reducing the size of pump needed, from 125hp down to 75hp, and was scheduled to run through the night when electricity rates were lowest. As demand was needed from the water tank a small 40hp booster pump was all that was needed to distribute the water to the system, saving the City energy costs as well. The new water system is now free of Uranium and meets the demands of the residents during peak usage, leaving plenty in reserve for emergency fires as well. 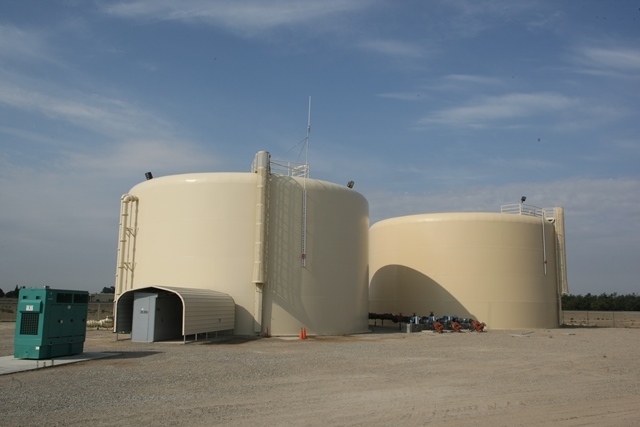 750,000 Gallon Tank: The new storage tank provides significant capacity to meet peak usage demands as well as reserves should a well need to be taken offline for any reason. SCADA Monitoring System: A radio transmitter was installed on each well pump to monitor performance remotely and adjust its output as needed. It is all accessible online from any computer with internet access, allowing the City Public Works staff to respond immediately to any situation. 3 New Wells: The new wells allowed the contaminated ones to be taken offline, getting the City back in compliance with the State. New 12″ Distribution Mains: These allow the City to increase distribution to meet the demands of the residents well into the future as the population continues to grow. Discover the openings available to grow your career with Yamabe & Horn Engineering.